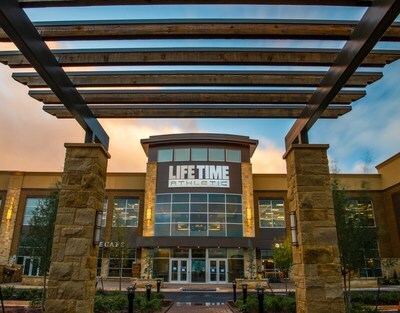 CHANHASSEN, Minn., Oct. 11, 2018 /PRNewswire/ -- When Life Time Athletic Oklahoma City opens its doors at Quail Springs Mall for workouts on Monday, October 15, the former Macy's site will become the first of many Life Time athletic lifestyle resorts at regional shopping centers across the country, changing the retail landscape for years to come. Life Time, the nation's only Healthy Way of Life brand, is entering the Oklahoma City market for the first time and celebrating with a grand opening to showcase the new space with tours, fitness demonstrations, food sampling and kids entertainment. The event will take place at 6 p.m. on Thursday, October 11. The club will open to all members at 4 a.m. on Monday, October 15. "This extraordinary development is a game changer not only for retail as its own category but more importantly for consumers who are looking to change their lives," said Jeff Zwiefel, Chief Operating Officer, Life Time. "Life Time Athletic Oklahoma City will bring a first-of-its-kind, athletic resort experience that simply is unmatched in the area. We're thrilled to become a part of this great community and help our members?from our youngest kids to most seasoned adults?live healthy, happy lives with our unique Healthy Way of Life approach." and a 26,000-square-foot tennis complex with four tennis courts and viewing area. Studio, Cycle and Yoga: More than 100 classes taught weekly led by the best performers in the market. Exclusive formats include Life Time's signature classes AMP, EDG and PWR indoor cycle, Strike!, TCX, LifeBarre, Warrior Sculpt, FIRE Yoga, WTRX and more. Life Time Training: Built on our "Know it. Nourish it. Move it." philosophy and backed by science. Personal and small group training provides a personal approach with proprietary assessments and plans. Kids Academy: A unique membership program for kids from three months to 11 years, and led by certified experts. More than 65 weekly classes including karate, yoga, music, Spanish immersion, tumbling and sports skills. LifeCafe: If it's here, it's healthy. Menu items contain only real, wholesome ingredients, free of artificial additives. Fast casual restaurant includes breakfast, lunch and dinner items, made-to-order meals and meals to go. LifeSpa: A full service salon and spa created with the well-being of the active, athletic human body in mind featuring massage, nail and esthetics services to both members and non-members. Ultimate Hoops: The largest recreational basketball league in the country, featuring leagues and pick-up games, along with training programs for youth and adults. The Zone: Dedicated space for athletic performance and recovery featuring metabolic assessments and nutrition coaching, sports and athletic recovery treatments, mobility services and chiropractic and physical therapy care. Life Time Athletic Oklahoma City is the 139th Life Time destination in North America and the second in Oklahoma. The club, located at Quail Springs Mall, 2563 W Memorial Rd, Oklahoma City, OK 73134, will be open seven days a week from 4 a.m. to midnight. For more information about Life Time Athletic, please call 405.832.5200 or visit lifetime.life/oklahomacity. Life Time champions a healthy and happy life for its members across 139 destinations in 39 major markets in the U.S. and Canada. As the nation's only Healthy Way of Life brand, Life Time delivers an unmatched athletic resort experience and provides a comprehensive healthy living, healthy aging and healthy entertainment experience that goes well beyond fitness to encompass the entire spectrum of daily life for individuals, couples and families of all ages.